On the occasion of the opening of “LIONS: Founding Years of UIMA in Chicago”, an exhibition exploring the story of the Ukrainian Institute of Modern Art, curator Robin Dluzen and artist Lialia Kuchma discuss the history of the organization, the unique spirit of UIMA’s founders, and the trials that accompany being a visible immigrant community in the United States. While the items on display in the exhibition are over 45 years old, the discussions of immigrant identity and heritage are just as resonant today. This complimentary event will take place in the Drawing Room Library at 11:00AM with seating first come, first served. Robin Dluzen is an artist, writer, art critic, and curator. She is co-curator of LIONS: Founding Years of UIMA in Chicago on view at the Ukrainian Institute of Modern Art, August 3 – September 30, 2018. Lialia Kuchma is a Ukrainian-born, Chicago-based artist who has been and continues to be a major force in both Chicago’s Ukrainian community and in the Chicago textile art community. 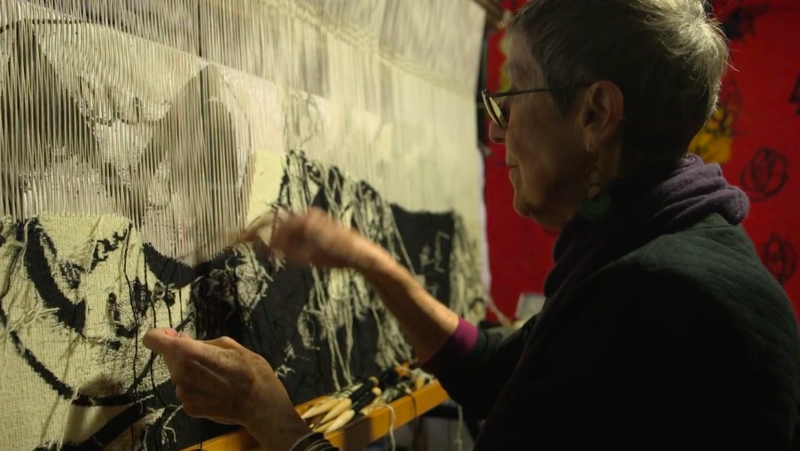 She began weaving in 1975. Photo caption: Artist Lialia Kuchma. Photo courtesy of the artist.